Diggers Valley: 9 July 2016. The week beginning the 9th of July 2016. 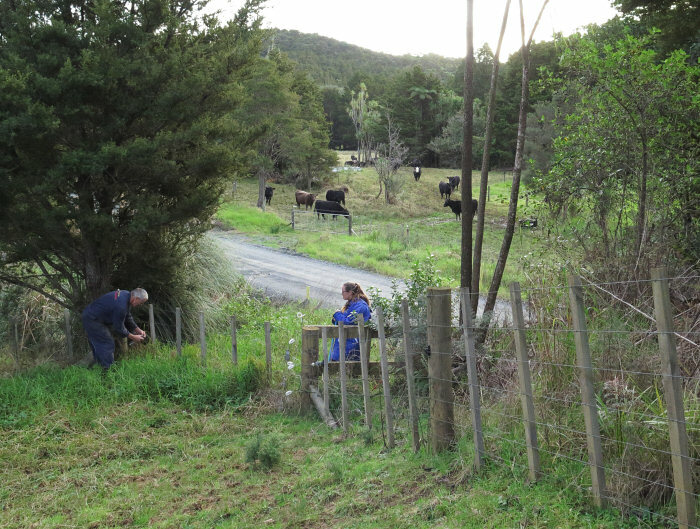 Because we had both Lois and Ella with us this morning, I hatched a plan to get the cows up the road (while there are no logging trucks running in the weekend) and into the Road Flat paddock, which we've only occasionally grazed since planting the orchard in half of it. 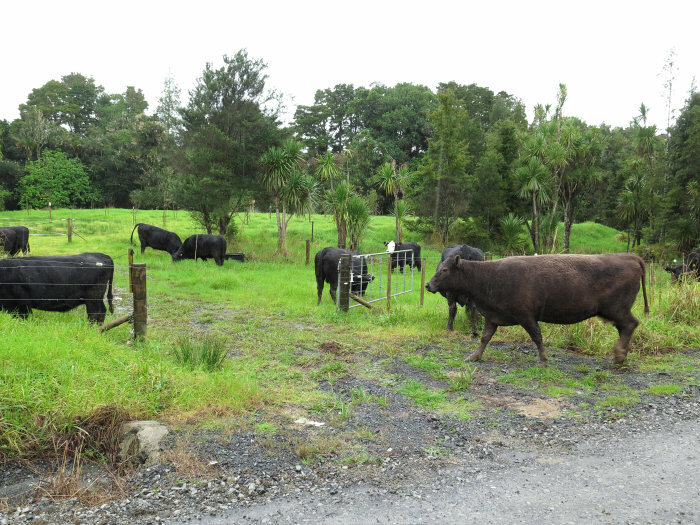 The orchard is safely fenced so the cattle can graze the rest of the paddock. A week or so ago Stephan heard a bird sound he didn't recognise, describing a bird as big as a hawk but with a more hooked bill. 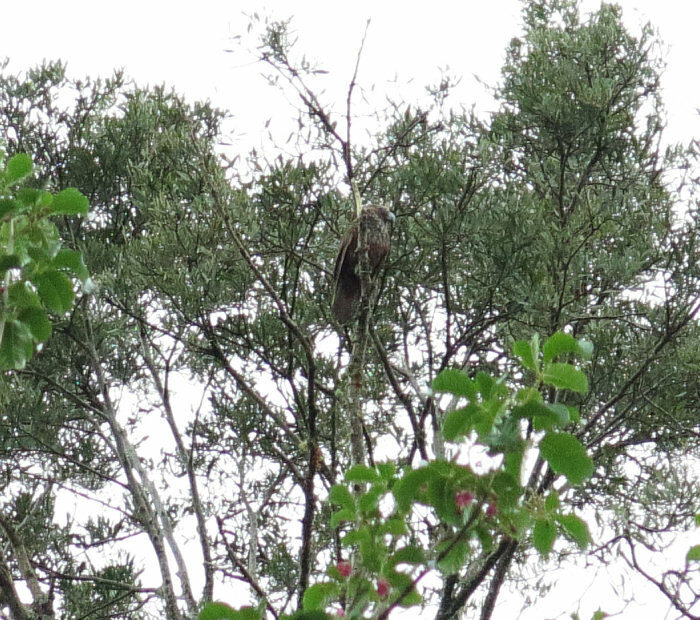 It's flight was in and around the trees, which was not usual hawk behaviour and I suggested it could be a Kaka. We looked up some pictures and listened to recorded calls and then kept looking out for it. This morning it was up in the tall Tasmanian Blackwood tree which grows on Jane's place. Definitely a Kaka! I'm pretty sure I've heard the same sorts of calls out the back on occasion but have never seen the birds. Lois went on her way and later, friend Gillian came out to stay. Gillian's primary household companion in the two years since her husband Pat died, has been a large, smelly dog named Joy; today Joy was euthanised with an aggressive and suddenly advanced cancer and Gillian was alone and very sad, so we said, come out and stay. It got dark before she arrived, so I sent Ella out to the gate with a little candle in a jar, to leave on the gate post. When you've only been here in the daylight, it can be a bit hard to know you're in the right place when it's dark. A little candle burning in the dark seems like such a welcoming thing. I, as always on this date, spent some time considering my lovely father, dead now an astonishing 27 years. Gillian went home to feed her cat and we talked about how to collect the sheep, since there were now three of us. In the end I stayed at home and got on with some writing and Ella and Stephan went to collect the ewes from Leonie's and Terry's care. 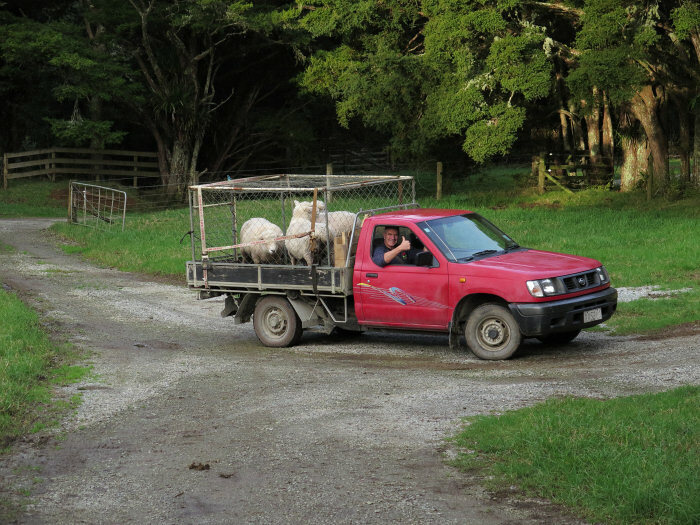 No need to put the sides on when the sheep are coming off the ute, although that did allow the first ewe off to simply jump to the ground, which was not the idea. 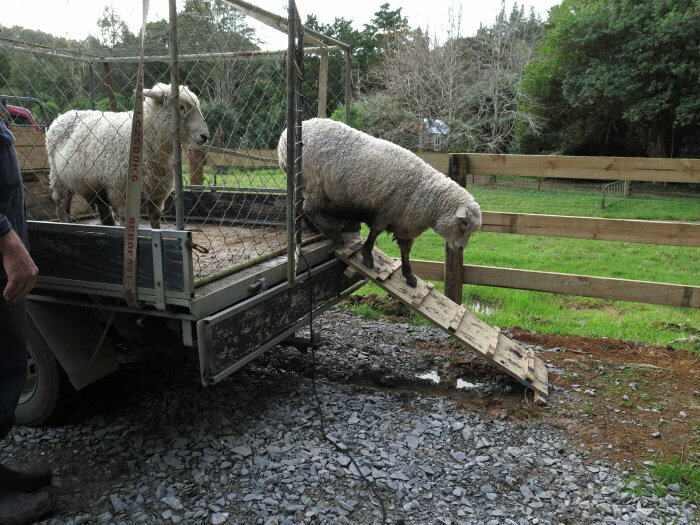 The ramp worked pretty well and saved a lot of heavy ewe handling when getting them on. There was just time and light enough to go up the road and put the cows back across into the hill paddock. This was the second part of my plan in using the Road Flat, that the few days' break the &frac23; part of Over the Road had had from the cows, would be enough in this instance to hold them for a day or two and then they can come back to the rest of the farm from the gate opposite the yards, rather than bringing them back along the road again. 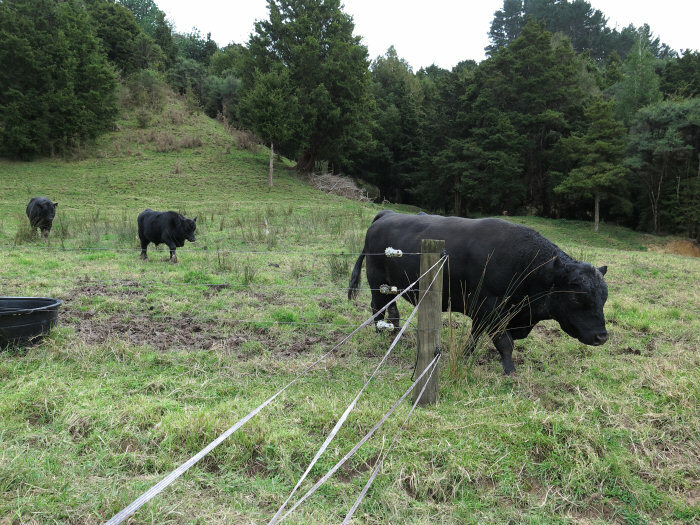 In both of these pictures Stephan was fiddling around with the electric fence which extends along the inside of the Taranaki gate (battens and wire, looks like a bit of the fence). We keep telling each other we'll put a gate in here but we'd still have to mess about with the electric wires. We will find a solution eventually, I'm sure. We went to town to be canine funeral assistants this morning. We collected dead Joy from the vet's freezer and went to Gillian's garden where Stephan dug a big hole. Poor Gillian. Stephan and Ella had made a little sign yesterday in the workshop, with Joy carved and stained into a nice piece of wood, now mounted on a short stake and pushed into the ground where Joy was buried. A bit of a jaunt today, firstly down to Whangarei for an appointment, then back to Kerikeri for another. The first was an experience I'd prefer not to repeat: an MRI scan to make sure that something weird going on in my head isn't being caused by anything anyone ought to do something about. What nobody told me was that the scan would take an hour. Someone asked me (via my ear-muffs' speaker) if I was alright, once, near the beginning of the process and then nothing. I began to imagine I'd been cast into some kind of mediaeval torture chamber, or gone straight to hell. I'd been offered music but there was none, only the interminable banging, whining and buzzing of the machinery. The young women, who'd been very personable before I entered the chamber, barely spoke to me as I left, which I imagined meant they'd seen something so terrible on the scan that they couldn't bear to meet my eye! But as I received no urgent phone calls over the next few days, I presume they were just adopting the usual Whangarei Hospital approach to patients. Poor Ella, who'd retreated to the car to read her book after the first half hour, imagined all sorts of terrible things had occurred to keep me so long. 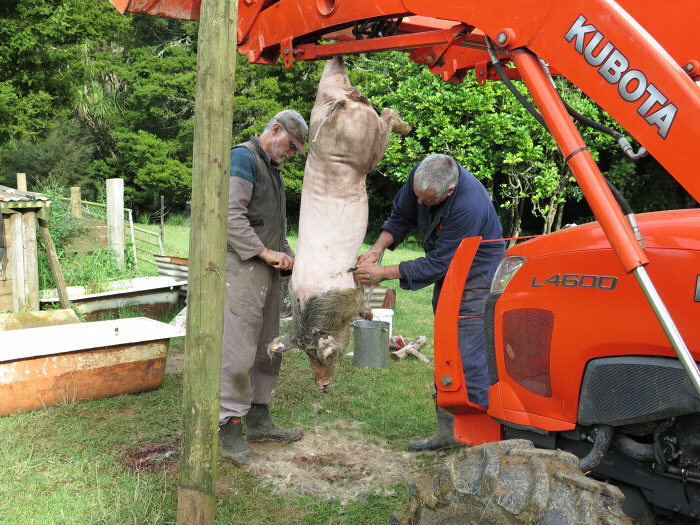 When we arrived home in the early evening, we decided that as the pig wouldn't need much breakfast in the morning, today could be Zella's first once-a-day milking day, so Stephan didn't have to go straight out and get her in. The third pig had grown considerably, on his own with no competition for food. He has seemed quite content by himself, just quietly mooching around in the enclosure. I always worry that one pig will be lonely but he was not obviously so. This one will be made into bacon and ham. In the afternoon I moved most of the cattle around; first the bulls, out of the Small Hill, where they'd been for nine days. 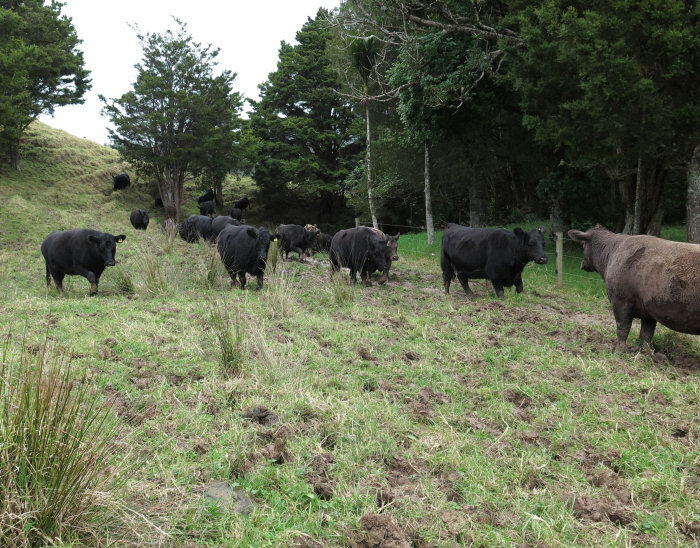 Then around to the Spring paddock, where I called the heifers and they came thundering down the hill in a great hurry, then across the stream to graze the other side, in the small Back Barn paddock. 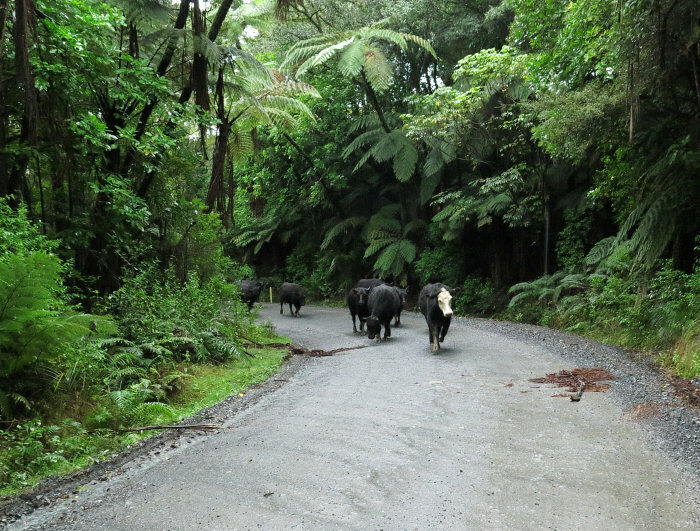 Lastly up Over the Road to call the cows. They came up from the far side and around the top of the reserve, then waited while I checked that everyone was there. I couldn't see 703, so went off down the hill where they'd come from, checking the bits of gully which aren't yet fenced, finding nothing. 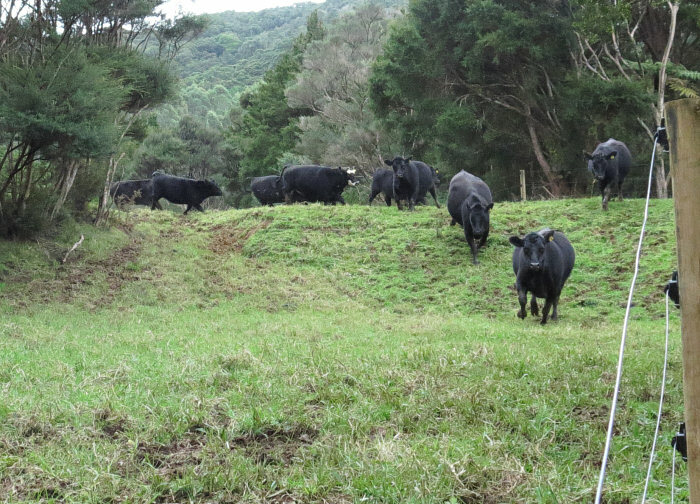 When I came back up over the ridge, the cows had come back to meet me and there was 703 amongst them. She was probably there all the time but sometimes it's hard to pick one cow out in the mob. I called them to follow me down the hill to the roadside and then heard Stephan and Ella calling too, ready and waiting down at the gate to help get the cows across the road. 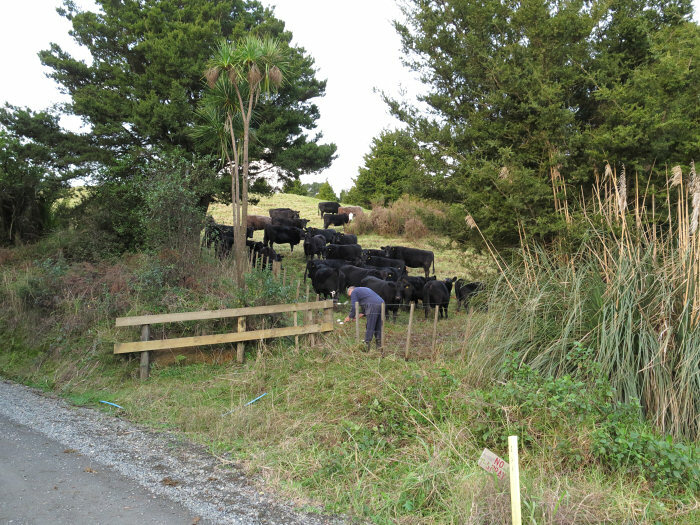 I'd set the gates for the cows to go out to the Pines but when they all came back down the lane before I had a chance to follow them, I changed my mind and put them to work in Flat 3, behind an electric tape, chewing down the rubbishy left-overs from the young mob. I try to cycle the mature cows through paddocks the calves have grazed, to eat up as many parasite larvae as possible, since the cows are mostly immune to their effects in their maturity and it is theoretically the young stock which allow the production of the most intestinal parasite eggs on the pasture. 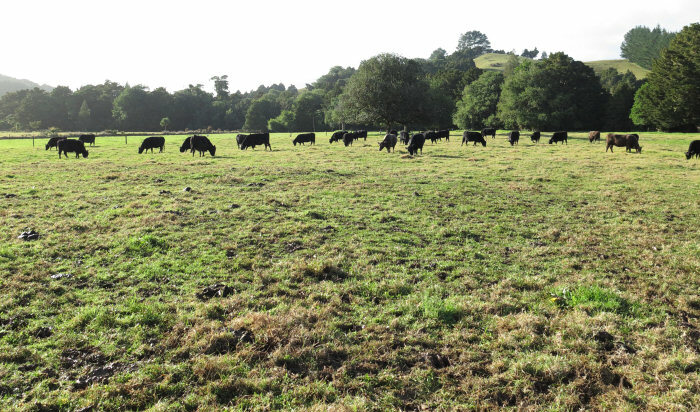 It's no good putting big, heavy animals onto the newly grassed areas though, so those paddocks can't be managed that way until the grass is a bit longer established. The cows, doing a great job. I'd just moved them to a new section of the paddock and here was the area they'd grazed last night. I don't think we ended up mowing this paddock. This is how we always used to get the pastures back under control and it still works pretty well. No matter how careful one is, it's difficult to manage the Kikuyu during its greatest growth spurt in the autumn, so winter is always a time to tidy up. 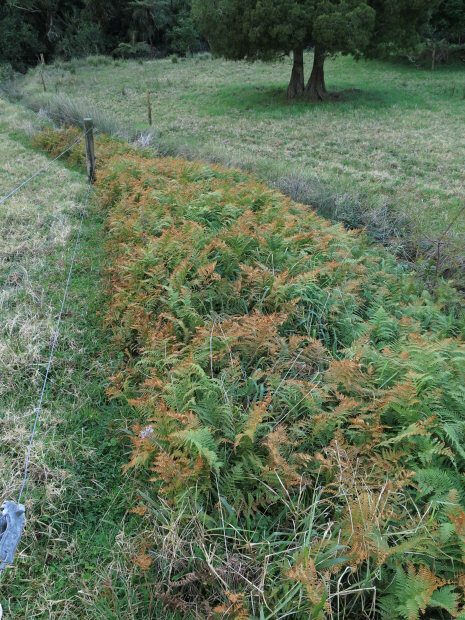 I think the frosts hit these ferns pretty hard. This pretty strip grows down along the (now fenced on both sides) drain which forms one side of the little separate area between Flats 1 and 2. Ella told me she'd noticed this little fountain when she and Stephan were out around the farm yesterday so I came to have a look. Our hillside has sprung a leak! 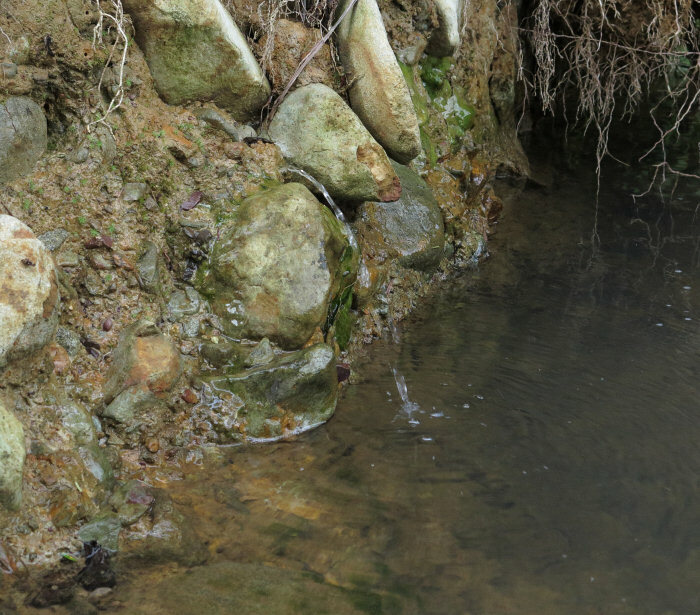 This is in the bank beside the last crossing before the Back Barn paddock, the water coming down out of the PW. We have so much water.